National Freedom Front leader Wimal Weerawansa yesterday alleged that the Maithripala Sirisena-Wickremesinghe coalition would make an attempt to bring in far reaching changes to the country’s legal framework to pave the way for a hybrid special court to try to hear war crime accusations. 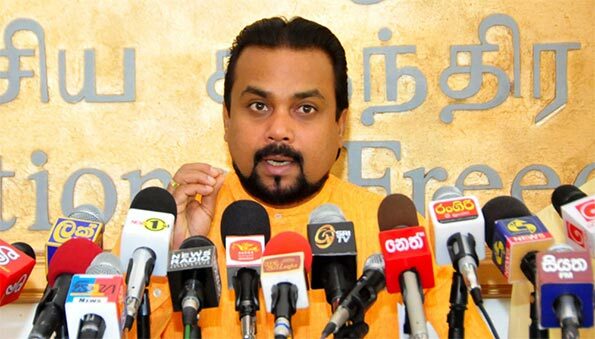 Addressing the media at the National Freedom Front (NFF) headquarters at Pelawatte Colombo District MP Weerawansa said that the UNP-SLFP marriage of convenience was meant to provide the required two-thirds majority in Parliament for amending the legal framework. MP Weerawansa alleged that Foreign Minister Mangala Samaraweera had, on behalf of the government, called for international intervention during his opening statement at the 30th Geneva session on Monday. President Maithripala Sirisena and Prime Minister Ranil Wickremesinghe formed a coalition after the latter failed to secure a simple majority in parliament. The UNP and its partner SLMC obtained 107 seats, whereas the UPFA managed 95 seats at the Aug. 17 parliamentary polls. Alleging that the so-called January 8 revolution had paved the way for a foreign intervention, the NFF leader insisted that Western powers and the new government were working in unison to appease those wanting to divide the country on ethnic lines. MP Weerawansa said that the 255-page report submitted to the Geneva-based United Nations Human Rights Council (UNHRC) was aimed at punishing those who had risked their lives to eradicate terrorism. Although the report claimed that it dealt with alleged atrocities committed by both the government and the LTTE during 2002-2009 period, it was really meant to be used against the State, MP Weerawansa alleged. Obviously, LTTE leader Velupillai Prabhakarana and his chief lieutenants couldn’t be held accountable as they had perished during the conflict, MP Weerawansa said, adding that an attempt was being made to fault Karuna Amman/TMVP over child conscription. MP Weerawansa said that Karuna wouldn’t have been targeted had he remained with the LTTE. Karuna’s crime was throwing his weight behind the military drive after having quit the organization in early 2004. Responding to a query by The Island, MP Weerawansa said that Tamil National Alliance (TNA) declaration in the run-up to the eelam war IV that the LTTE was the sole representative of Tamil speaking people was irrelevant in spite it being recognised as the main Opposition. Weerawansa asked why the TNA-LTTE relationship wasn’t a matter for the proposed hybrid court. The former JVP heavyweight alleged that the proposed investigative mechanism couldn’t be called a hybrid court under any circumstance. The Hybrid court was nothing but a ruse to deceive the country, MP Weerawansa said, pointing out that those apologists for proposed UN action hadn’t even bothered to peruse the latest report. Weerawansa said that the UN had called for the integration of international judges, prosecutors, lawyers and investigators, hence placing the project effectively under the control of foreign elements. Alleging that many had conveniently forgotten that the proposed investigative mechanism would be funded by the UN, MP Weerawansa speculated about the possibility of the so-called hybrid special court being established in the Northern Province. An irate Weerawansa said that the UN would accommodate two or perhaps three local judges in the proposed hybrid special court to camouflage it as a local probe. The inquiring mechanism would operate in accordance with the Hague based International Criminal Court (ICC)). Although Premier Ranil Wickremesinghe and the UNP had declared that they had saved former President Mahunda Rajapaksa from the ICC by not ratifying the Rome Statute, the Premier had paved the way for a foreign mechanism to prefer war crimes charges against former President Mahinda Rajapaksa, former Defence Secretary Gotabhaya Rajapaksa, service chiefs and those who had commanded troops on the ground. Weerawansa said that his party would do everything in its power to raise awareness among the people as regards the impending danger. How could you allow those who had risked their lives for the wellbeing of the nation be allowed to face foreign judges? Sri Lankans weren’t an ungrateful people and, therefore, the people should strongly oppose the UN-government move, MP Weerawansa said. The fight against the UN intervention had to be carried out regardless of party affiliations the MP said, urging supporters of all political parties to pressure their parliamentary representatives not to support the proposed judicial and constitutional reforms required to set up foreign courts here. The NFF leader said that a recent move made by the government reflected the thinking of its leadership. Home Affairs Minister Vajira Abeywardena had sought Cabinet approval to pay compensation to those who had perished fighting for the LTTE. An irate Weerawsansa said that there couldn’t have been another example either here or abroad where taxpayers compensated terrorists. Weerawansa said that the Bar Association of Sri Lanka (BASL) should reveal its stand on UN assessment that the local judiciary was incapable of conducting an independent and credible investigation. The UN also highlighted what it called the inadequacy of Sri Lanka’s domestic legal framework in its latest report on Sri Lanka. Of course this is a trick. The Sri lankan and UN officials will investigate, but the decision will made by the UN officils. Remember Sri lanka is a third world country. At the end of the day it will be said, that the SL investigating officials also made the same report as the UN officials. This is what the west wants, to divide the country and kill each other. What are you winging about if there is nothing to hide especially when our most esteemed former President declared that there were no civilian casualities during the final phase of the war. He said our valient soldiers fought the evil tigers with the HR charter in one hand.